With bright yellow, low-growing flowers, no wonder where the Basket of Gold got its name. 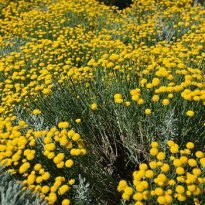 Given its short height and golden color, this makes for a perfect addition to a rock garden or xeriscape. It requires a Full Sun and a Well-drained soil. Zones: 4 – 8 with a Height of about 0.5 – 0.75 feet tall, it also blooms in Late Spring – Early Summer and is Deer resistant.